The European VS01 Soyuz on the launchpad in Kourou (Credits: ESA). Source ESA, 15 October 2011: The first Soyuz to take off from Europe’s Spaceport in French Guiana was moved to the launch pad yesterday. The rocket that will carry the first two Galileo navigation satellites into orbit is on track for liftoff on 20 October. The three-stage Soyuz ST-B was rolled out horizontally on its erector from the preparation building using the 600 m-long railway that leads to the pad. The vehicle was then raised into its launch position. Earlier this week, the two Galileo In-Orbit Validation satellites, attached to their dispenser, were mated to the Fregat-MT upper stage and then enclosed in the fairing. This ‘Upper Composite’ was also transferred yesterday and added onto the vehicle from above, completing the very first Soyuz on its launch pad at Europe’s Spaceport. Soyuz VS01 transfer to launch zone. Note the characteristic vernier disposition (Credits ESA). 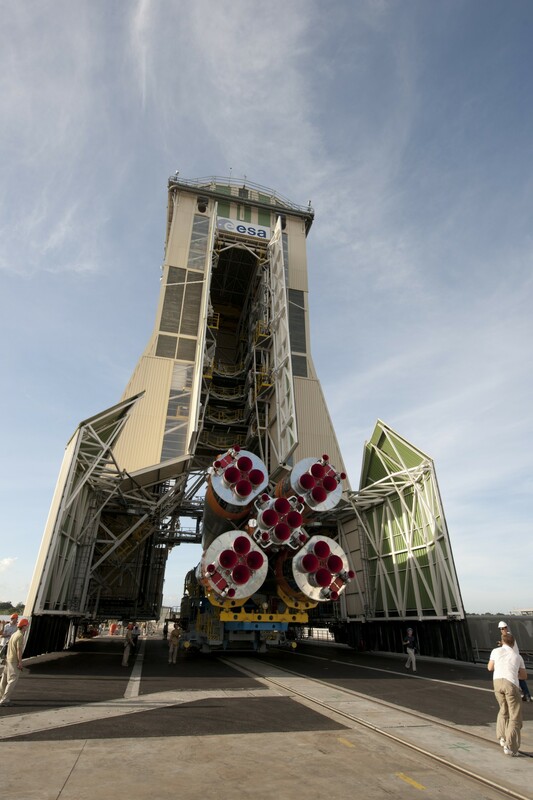 The new mobile launch gantry, built specifically for the rocket’s operations in French Guiana, also protects the satellites and the vehicle from the humid tropical environment. 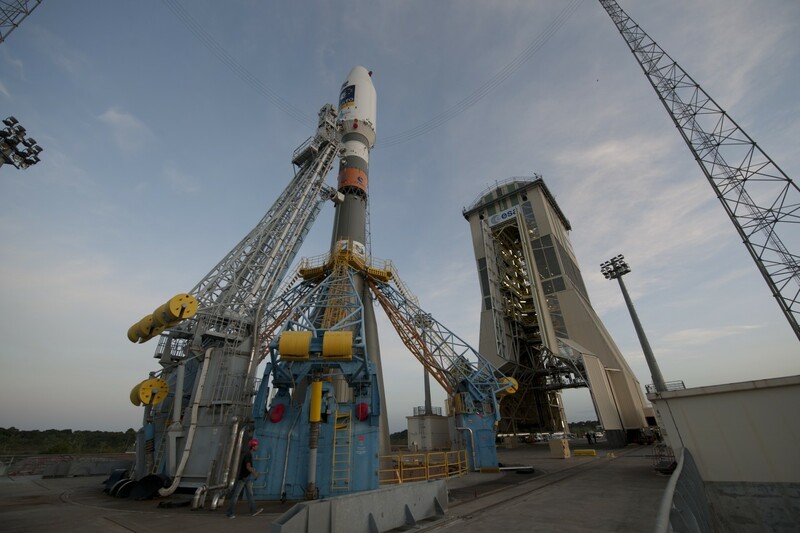 The Soyuz and Upper Composite will undergo a full launch dress rehearsal in the next few days, including preparations for fuelling the vehicle, which will begin four and a half hours before liftoff. October’s launch will be doubly historic: the first Soyuz from a spaceport outside of Baikonur in Kazakhstan or Plesetsk in Russia and the start of building Europe’s Galileo satnav constellation. As a medium-class vehicle, Soyuz will complement Ariane and Vega to extend the flexibility and competitiveness of Europe’s launcher family. Next year, the second pair of satellites will arrive in orbit, ready to prove the design of the Galileo system in advance of the other 26 satellites. This quartet of satellites, built by a consortium led by EADS Astrium Germany, will form the operational nucleus of the full Galileo constellation. Check the slideshow. Video, below, time lapse view of Soyuz dry run.